The Cassidy Jets escaped from Norway with a hard fought 21-13 victory over the Oslo Vikings. The win means that the Jets top their group and qualify for the Eurobowl Quarter-Final where they will face Europe’s second ranked club, the Swarco Tirol Raiders. The MVP award was shared by the teams offensive line for their incredible effort which allowed quarterback Dax Michelena time to find his receivers and the option to run, which he did to devastating effect, finishing with 126 yards on 13 carries. Jubilant Head Coach Gerry McManus also heaped praise on his secondary “They were magnificent today, they kept a top notch receiving core loaded with imports in check all day” The trio of Ahmed Hashim, Adam Biggs and Dominic Olney broke up 9 passes between them and came up with a timely turnover too. Winning the opening toss, the Jets elected to kick off. The Vikings looked as though they would make McManus regret his decision as they systematically marched the ball inside the Jets redzone. Veteran defensive tackle Mark Connolly and linebacker Alistair Bailey combined for 3 tackles and a quarterback hurry to end the drive and avert the danger of falling behind early. In what looked eerily similar to the Valencia game, the powerful Jets offense was unable to throw off the shackles early and their first drive petered out before it really began. They wouldn’t have to wait very long to get back out onto the field as Olney got an early turnover when he picked off quarterback Howard Bouldin’s under thrown pass. Running back Steve Coles rumbled for a gain of 11 yards to put the Jets into scoring position but Michelena’s pass to Mark Cohen fell short and Deonte Morris picked it off at the 4 yard line. With time winding down in the first quarter and the Jets back on the field, Michelena began to find his rhythm, completing 3 straight passes culminating in the opening score, a 10 yard bullet to James Hossack. Coventry’s extra point hoodoo showed no signs of abating as Coles missed his kick leaving the club 0-7 on the season. The resilient Vikings responded with a 12 play scoring drive eating up much of the second quarter. Former NFL Europe running back Nicolay Aslaksen carried the load before Imports Bouldin and Morris combined on 28 yard touchdown. Sigbjorn Tveitras’ extra point handed the Norwegians a 7-6 lead as half time rapidly approached. Not content to go in trailing Coventry launched another offensive as Jeremy Simms finished a quick drive with an 11 yard catch for a 12-7 lead. As well as leading the team in receptions (7) the tireless wideout ‘sucked it up’ to play both ways appearing also as a pass rushing defensive end. Outside linebacker Parm Sidhu handed the Cassidy Jets the best possible start to the second half. Reminiscent of his perfect read against Valencia, Sidhu again got himself in position and, after a brief juggle, secured his second Interception on the year. The turnover lead to 3 valuable points as Coles slotted home a field goal from 25 yards. That would be the only score of a closely contested 3rd quarter. Early in the 4th Oslo got right back into it with Bouldin’s 3 yard touchdown run. The nifty quarterback from Missouri State University span out of no fewer than 4 Jets attempted tackles pulling his club to within 2 points at 15-13. Sidney Oliver attempted to run the ball in on the extra point but his attempt was snuffed out by Craig Pennington’s dogged pursuit preserving Coventry’s lead. After earlier having a 70 yard touchdown called back for a clipping penalty Cohen was in danger of suffering his first ever appearance in a Cassidy Jets uniform in which he didn’t have a reception. After seeing his touchdown streak snapped in April last year the giant receiver wasn’t about to let this one slip from his grasp. With what would prove to be the last reception of the game Cohen out-leapt his coverage to come down with a 34 yard pass landing on the Vikings’ 1 yard line. Michelena wasted no time running the ball in on the very next play. Predictably the Jets failed to convert the extra point again and are yet to do so in a Eurobowl game. Trailing 21-13 the Vikings knew I tie game would be enough to send them on to Austria. Their big play offense didn’t disappoint, driving the ball down inside Coventry’s 10. With just 50 seconds remaining Oslo would have 4 goes to get the score they needed. On first and second down Paul Newey and Prince floyd respectively brought down Aslaksen. Bouldin’s final 2 attempts would both fall incomplete, one at the hands of a great play from Adam Biggs. After being illegally pushed off Biggs was able to recover sufficiently to force Morris to the ground and as the rangy receiver hit the hard turf the ball popped loose causing an incompletion. The fourth down play never got going as the Cassidy Jets secondary shut down all of Bouldin’s options and he threw erantly out of the back of the endzone. The Jets sideline erupted in celebration as the game was effectively won. McManus later hailed a “magnificent achievement brought about by tremendous teamwork. 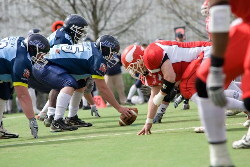 We look forward to representing British American Football at the next level”. The reward will see the Cassidy Jets travel to Innsbruck, Austria for their quarter-final date on the 10th of May.